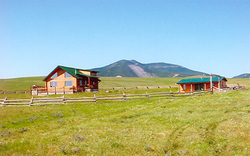 Sharptail Cabin is a unique vacation spot in the heart of Montana. Relax and enjoy the scenic vistas of the Judith Basin and beyond. After taking advantage of the area's sightseeing and recreational opportunities, unwind in our exclusive, century old Finnish Sauna. Sharptail is a private, modern log cabin featuring 2000 square feet of furnished living space on three levels, including four bedrooms and two bathrooms. In addition to laundry facilities, the basement includes a pinball machine and foosball table. The cabin will sleep thirteen people comfortably but will easily accommodate sixteen to eighteen. Enjoy our new 2 bath, 2 bedroom bunkhouse. Unwind in the jacuzzi tub in the Bullwinkle Room. Directions: Sharptail Cabin is nestled in the shadow of Peterson Mountain in the Little Belt Mountains of central Montana, the state's newest getaway spot. Situated between Great Falls and Lewistown near Geyser, Montana. Located just 7 miles south of Geyser.